So I have a drop-down menu in order sheet and I have an info sheet. In the info sheet, I have 2 columns, column A has the customer name, column B has the customer e-mail. So what I'd like to do is, in the order sheet select a customer name, then the column next to it would auto-populate their e-mail address. I have 43 customers with 43 e-mails and it's inconvenient to select the customer (IE Joe H.) and the try to find that guys e-mail from another drop-down list. If it could auto-populate it would be nice. Basically, I was looking at the IF command or LOOKUP command and I'm a little confused which will best suit my needs. 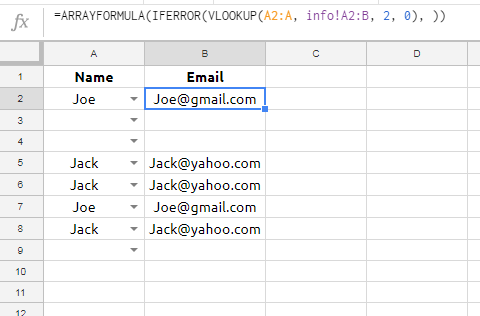 If column A in order sheets is Joe, then column B in order sheets is automatically Joe@gmail.com, if column A is Jack then column B is Jack@yahoo.com and so on. Auto populate data in Google Spreadsheet from data in separate spreadsheet?